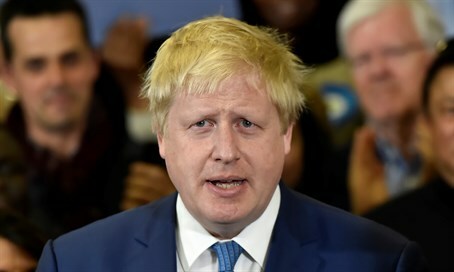 In surprising turn of events, leading former London Mayor and prominent Brexit proponent Boris Johnson says he won't run for prime minister. The Brexit saga continues to produce twists in the tale. In a surprising announcement, former London Mayor Boris Johnson, one of the most visible and vocal proponents of the "Leave" campaign in the Brexit referendum, and one who'd been tabbed by many as the overwhelming favorite to be the next Prime Minister of Britain, has said that he will not run for the office. In a speech given to the press this morning (Thursday), Johnson opened with praise for the decision to leave the European Union, calling on his fellow British citizens and leaders to "seize this chance and make it our moment to stand tall in the world." Exhibiting his usual flair for the dramatic, Johnson first outlined the "agenda for the next Prime Minister of this country", paused, and only then made his main announcement: "Having consulted colleagues and in view of the circumstances in Parliament, I have concluded that that person [the next Prime Minister] cannot be me." The maverick politician's decision to remove himself from consideration is yet another unexpected twist in what has been a very unpredictable several weeks for Britain and Europe.